As a member of Timber Ridge Ski Patrol, you will have access to the extensive National Ski Patrol (NSP) education programs. These programs offer you the chance to learn about emergency care, search and rescue, avalanche control, lift evacuation, mountaineering, toboggan handling, and other interesting topics. 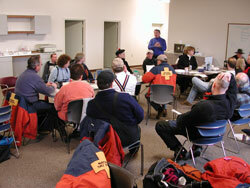 You'll test your knowledge and your skills with personalized support from your ski area and fellow patrollers. You'll also receive a free subscription to Ski Patrol Magazine, which provides timely information on emergency care and rescue techniques, skiing and snowboarding tips, association news, and more. NSP programs are an exciting challenge - in the classroom and on the slopes. For over 70 years the NSP has provided patrollers an excellent opportunity to improve their emergency management, toboggan handling, and skiing skills. The Timber Ridge Ski Patrol has provided intensive skills instruction to many aspiring Senior Program candidates, as well as entry-level patrollers and toboggan-handling instructors. The volunteer patrol staff here at Timber Ridge Ski Area meets high standards of professionalism and receives special training over the course of candidacy that includes emergency medical care, ski and snowboard training, and transportation of injured skiers by the use of toboggans. There are two major steps to becoming a patoller. 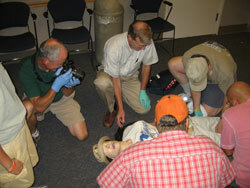 OEC Course: Take and successfully complete an OEC (Outdoor Emergency Care) course in your area. Courses start in late summer, so that they are completed in time to begin on-hill training in December. On-hill Training: This is the practical training concerning skiing, rescue, toboggan handling, and the specific techniques used at ski hills to manage area accidents, including documentation, EMS transportation, radio protocols, equipment caching and scene/resource management. Training is scheduled on specific weekend nights to conclude in the late-January to early March timeframe, depending on snow conditions. Alpine Patroller – After OEC completion and successful on-hill training, you will provide emergency care to injured or ill area guests and transport injured guests off of the mountain using toboggans. 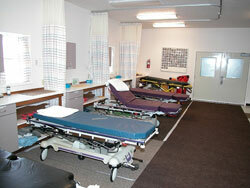 You will also be responsible for a wide variety of area safety activities. This is a skiing or snowboarding position. Patroller – This is a person who provides emergency care to injured or ill guests but does not transport guests off the slopes. You may also help with or lead training and education activities. In this position, skiing or snowboarding skills are helpful but not mandatory. Other than demonstrating physical skill proficiency, mental acuity to manage complex situations within hazardous environments, and the ability to work well on a team, the patrol does not discriminate on the basis of age*, race, gender, income or nationality. On the contrary, we are proud of and enjoy the diversity of our patrollers. *Note: As a local policy, we accept individuals 18 years of age and over. We will make exceptions on a case-by-case basis for persons under 18. During your first year, you will be classified as a "candidate" patroller and will spend most of your time in training. This training is provided first in a classroom setting, then in on-snow practice sessions and eventually directly on-the-job. About 18-20 days of on-hill training is needed to become proficient in on-snow emergency care, rescue toboggan operation, and skiing in all snow conditions. We require a current American Heart Association BLS for Healthcare Providers (CPR & AED) certification. Before your actual acceptance as a patroller, you will need to successfully complete a National Ski Patrol Outdoor Emergency Care (OEC) course. You will train extensively to gain the ski or snowboarding skills to successfully handle a loaded toboggan on any run in any weather and in any snow conditions. Outdoor Emergency Care is the NSP’s award-winning training program for patrollers and others in the recreation community who deal with emergency situations. This nationally recognized program is designed to help you manage the toughest emergencies, in all seasons. Developed in the late 1980s by the National Ski Patrol, Outdoor Emergency Care is a training program that is tailored to the nonurban rescuer. Over the years, OEC has evolved to address the needs of other outdoor-based emergency care providers too, including wilderness medical technicians, river rafting and mountaineering guides, members of search and rescue groups, mountain bike patrollers, and parks and recreation employees. Today, OEC is considered the gold standard of training for emergency care in the outdoor environment and is recognized by resorts and recreational facilities in all 50 states. To master the OEC objectives, a candidate typically needs to devote 80 to 100 hours of class and study time to the course.